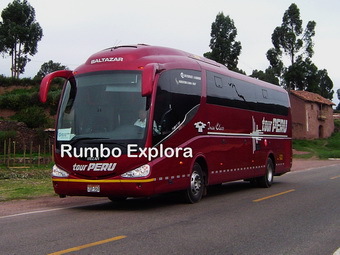 DAY 01: BUS PUNO – CUSCO: Early departure by bus to the city of Cusco. Travel along the high plateau arriving to Pucara, town of talented ceramicists and cradle of the ancient civilizations, located 106 km away from Puno, an important place of livestock, textiles and pottery. On this area Pucará culture was developed over 3000 years ago, today it is possible to see the famous temple of Kalasaya an archaeological site, where the people of Pucará culture had made offerings to the Pachamama and to sun. Also visit the museum that holds the remains of the Pucara culture such as obelisks, potteries, textiles and human bones, because this culture is considered one of the first civilizations of the Peruvian-Bolivian high plateau. 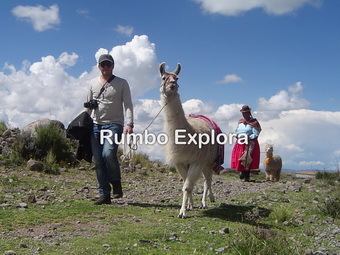 La Raya: Continuing the trip we got to La Raya the highest point on the route Puno to Cusco which is 4338 m cold and remote place, where we will see the snowy peaks of the Andes Mountains Range, the South American camelids like llamas, alpacas and vicuñas. 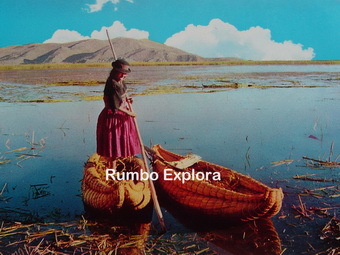 La Raya is the limit between Puno and Cusco; here it originates the rivers that go to Cusco and Lake Titicaca. Sicuani: We stop to have lunch at a quiet countryside restaurant where you will enjoy the traditional Peruvian dish (buffet lunch). Raqchi: After lunch we continue with the trip visiting Raqchi, one of the most important places in the Inca times, as Raqchi was the limit between Cusco and Puno (route to Collasuyo) for that reason was built here over 200 barns (food stores, to save food in the drought time), agricultural terraces, stone walls, and qolqas (store houses). Also here is located one of the largest temples built in the time of the Inca Pachacutec to devote as worship to the god Wiracocha. There is a great central wall with a stone base likewise there are other walls built of adobe (water, mud and straw) now a day it is used to build houses in rural areas in the Andes. The central wall has a height of 12m, 92m long, 25.5m wide, 1.20m thick walls, its roof a slope of 50 °, the columns were 1.60m in diameter and height of 9.80 m. Andahuaylillas: Typical Andean village from colonial time, of origin and unique architecture located 40 km away from Cusco on the river Vilcanota. In Andahuaylillas stand out its Catholic church from the colonial time with a beautiful mural decoration since XVII and XVIII century known as the Sistine Chapel of América, the quality of the artwork found inside. 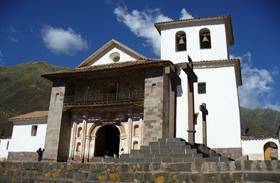 This church was built on Incas construction by the Jesuits in the XVI century, with walls of adobe and stone columns. Inside of the church left side is the inscription I baptize you in the name of the Father and the Son and the Holy Spirit Amen, the most interesting is that the inscription is written in 5 languages like Latin, Quechua, Aimara, uro puquina and Castilian (uro puquina extinct). 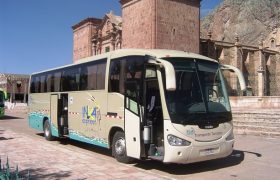 Arrival to Cusco, the capital of the Inca Empire. 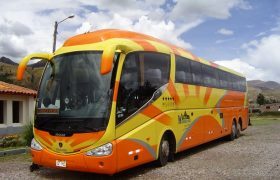 Share the post "Bus Puno Cusco + Stops & Lunch"